Awareness: The traditional digital customer funnel starts at creating product awareness through impression-based display advertising and sponsorships. Interest: The consumer continues down the purchase path when consumers demonstrate intent through behavioral and contextual signals. Those consumers can be targeted using a large variety of pre-packaged 3rd party segments. Desire: Digital marketers capture a user’s desire, when they demonstrate affinity by clicking on an ad or visiting a product’s website. These consumers can be reached digitally through retargeting. The perfect storm of advanced, extensible CRM platform technology, near ubiquitous availability and scale of social signals, and ability to activate first party data has extended the purchase funnel. Once the consumer “drops through” the real action starts. Joins: Once in the customer database (CRM), the post-purchase journey starts with a commitment beyond the sale, when a consumer joins an e-mail list or signs up for special offers on the company’s site. Likes: The next step is an expression of social interest, when the consumer agrees to make public his “like” for a company or brand by “friending” a company’s Facebook page, following a company’s Twitter account. Recommends: Beyond the like or follow is true social activation, wherein the consumer actively (not passively) recommends the product or service, through commenting, sharing, or other active social behaviors, thus showing his brand affinity. Sells: The final step is having the consumer sell on your behalf (directly via affiliate programs or, in the softer sense, as a “brand ambassador”). 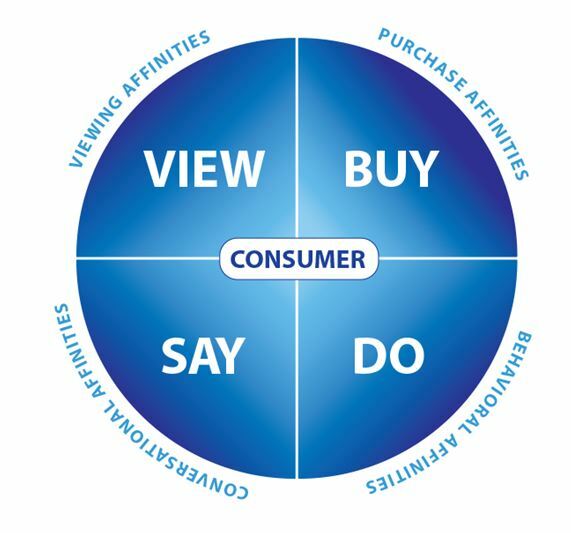 To navigate the consumer from brand awareness, all the way through to actually selling on behalf of a brand takes an understanding of data and its application to each step in the journey. The most successful companies leveraging this new inverted funnel paradigm are aligning their first party CRM data with social affinity data to get a 360-degree view of their typical consumer—and modeling against that view to produce repeatable marketing outcomes. What does that mean? It is not enough to understand your brand’s core demographic (e.g., male, aged 25-36, single family home, income >$125,000). That data is important, and you can certainly make somewhat efficient digital media decisions with it. Once that person expresses “desire” by visiting your website, you can certainly retarget him. And, once he finally purchases, you can pretend you “own” him, and deploy the various traditional CRM marketing tactics to create return purchases. All well and good. The challenge is getting that person to like you back, and mutually engage with your brand. Once he is in your CRM, are you prepared to deliver new content to him via social media channels? Can you find the linkages between him and his internet friends, and get downstream of his activity via social affinity signals? Ultimately, can you create enough incentive, through affiliate programs, social gaming, couponing, or other active programs, to enable him to actually sell on your behalf? That is today’s digital marketing challenge—and it resides inside an integrated social CRM. That’s why Salesforce bought Radian6 and Buddy Media, and why Oracle bought Vitrue and Involver. It will take some time for these new social data tools to get properly embedded into the traditional CRM, and even longer for marketers to get adept at leveraging them at scale—but we are now living in an inverted funnel world. Be prepared to turn your thinking about digital marketing upside down. Marketers are increasingly turning to social platform data to understand their customers, and tapping into their social graphs to reach more of them. Facebook “likes” and Twitter “follows” are religiously captured and analyzed, and audience models are created—all in the service of trying to scale the most powerful type of marketing of all: Word-of-mouth. With CRM players (like Salesforce, who recently acquired Buddy Media and Radian6) jumping into the game, digitally-derived social data is now an established part of traditional marketing. But, are marketers actually finding real signals amid the noise of social data? In other words, if I “like” Lady Gaga, and you “like” Lady Gaga, and my ten year old daughter also “likes” Lady Gaga, then what is the value of knowing that? If I want to leverage social data to enrich my audience profiles, and try and get the fabled “360 degree” view of my customer, “likes” and “follows” may contribute more noise than insight. I recently sat down with Colligent’s Sree Nagarajan to discuss how brand marketers can go beyond the like, and get more value out of the sea of social data. Colligent (“collectively intelligent,” if you like) goes beyond “likes” and actually measures what people do on social sites. In other words, if you merely “like” Lady Gaga, you are not measured, but if you post a Lady Gaga music video, you are. By scraping several hundred million Facebook profiles, and accessing the Twitter firehose of data, Nagarajan’s company looks at what people are socially passionate about—and matches it against other interests. For example, the data may reveal that 5% of Ford’s socially active fanbase is also wild about NASCAR. That’s great to know. The twist is that Colligent focuses on the folks who are nuts about NASCAR—and like Ford back. That’s called mutual engagement and, arguably, a more powerful signal. Television: Media planners can buy the shows, networks, and radio stations that a brand’s fans are highly engaged with. Public Relations: Flacks can direct coverage towards the media outlets a brand’s fans are engaged with. Sponsorships: Marketers can leverage affinity data to determine which celebrity should be a brand’s spokesperson. Search: SEM directors can expand keyword lists for Google and Facebook buys using social affinity-suggested keywords. Display: Discover what sites Ford’s socially activated consumers like, and buy those sites at the domain level to get performance lift on premium guaranteed inventory buys. Look for this trend to continue, especially as company’s become more aggressive aligning their CRM databases with social data.